The Pepwave Surf-On-The-Go is a versatile travel router that offers a variety of Internet sharing capabilities, making it a must-have gadget for frequent travelers and road warriors. Do you travel frequently and constantly find yourself jugging single user-ids for complementary Wi-Fi on multiple devices including your laptop, tablet, e-reader and/or smartphone? Ordo you often stay at hotels that only offer wired Internet access, forcing you to literally roam the streets hunting for a Wi-Fi hotspot for your iPad or other mobile device? Well, the Pepwave Surf On-The-Go (OTG) is touted by its manufacturer as the ultimate travel router to address precisely these predicaments. Let's take a look at how the gadget holds up to those claims. The Pepwave Surf OTG is a device with four distinct operating modes.Here's an quick outline of the possible use-cases for the various Surf OTG modes. When you're at a hotel that only offers wired Internet access the Surf OTG can connect to your room's Ethernet port to provide wireless Internet access for all your Wi-Fi devices. when you stay at a hotel or other establishment that provides free Wi-Fi Internet access, but are granted only one login ID. You can use the Surf OTG to login wirelessly and turn the device into a Wi-Fi Access Point (AP) to share the Internet with all your wireless devices. You have a cellular Internet subscription plan and associated 3G/LTE USB dongle, and want to use it for Internet access for more than just the one device your USB dongle plugs into. You can simply plug your celluar USB dongle into the Surf OTG to turn it into a wireless hotspot for multiple devices. You want to connect an old computer to the Web, but it only has an Ethernet port, no wireless adapter. You can plug in the Surf OTG to use it as a Wi-Fi adapter. 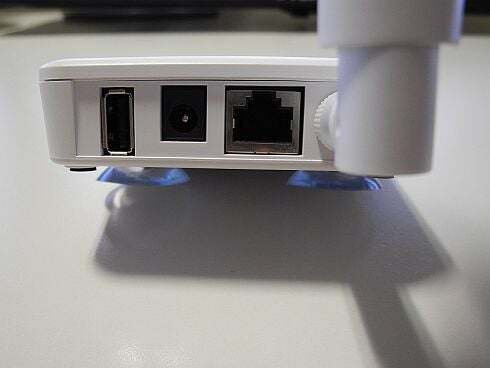 In a nutshell, the Surf OTG connects you to a WAN (the Internet) using either a USB mobile dongle, wired Ethernet connection, or a Wi-Fi hotspot. You choose the connectivity method by logging into the Web interface and clicking on the appropriate icon (See Figure 1 below). I've found that in most cases the default settings worked just fine, but you can make any necessary changes via the "Settings" page (See Figure 2 below). Connecting to both wired and cellular networks is relatively straight-forward, and the gadget should automatically detect the necessary settings, though connecting to protected Wi-Fi networks requires the pertinent authentication details. A variety of authentication options are available, including WPA Enterprise, WPA Personal, 802.1x and WEP. And you ca create a profile that is saved by the Surf OTG router so you don't have to repeatedly re-enter the same information. Four LED lights on the right of the router's front panel serve as visual indicators of the signal strength of the wireless network the Surf OTG is connected to. Another LED labeled "RDY" goes red if there's a problem with Internet access and switches to green when a connection is established. So how does the Surf OTG fare as a Wi-Fi AP? In my tests, conducted with my iPhone at various locations around my home, the signal strength of the Surf OTG appears a tad weaker than my business-grade AP, though it seems to works about as well as any home wireless router. One added bonus: The Surf OTG uses network address translation (NAT) technology to share Internet access, so users get an additional layer of protection against simple hacking attempts and port scans by the NAT firewall. The Surf OTG also lets you stipulate QoS (Quality of Service) by assigning different priorities for voice and video streams, as well as basic port forwarding settings and the ability to configure a DMZ host. The device firmware is upgradable via online firmware check or by manually uploading an image file. Overall, I was very impressed with the device's well-designed Web interface, which carefully hides some of the advanced capabilities of the Surf OTG. What I like most about the device is that the default settings mostly worked well, but more detailed configurations are available for "power users." Troubleshooting tips are readily accessable via detailed information that is neatly sorted into clear categories. And the LED meter proved extremely handy in determining the Wi-Fi signal level. As much as I appreciated the elegance of the Web interface, a physical toggle switch that let you jump between the various WAN modes would be very useful. My other complaints are relatively minor, such as the fact that Ethernet indicator light is oddly labelled "ENET" instead of the more familiar "ETH." Finally, I also wish that the Surf OTG could be powered solely by the USB port instead of having to lug the incuded AC adapter along. 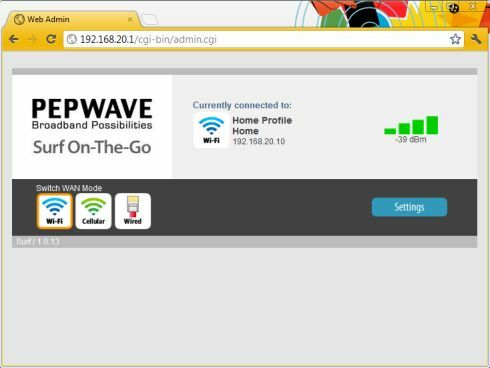 Ultimately, the Pepwave Surf OTG is a great travel router that delivers on the promise of facilitating Internet access for all your Wi-Fi-enabled devices. It is available from a variety of online retailers, including 3GStore.com for $99.99 here. [Figure 1] Unavailable options are greyed out, while the current selection is highlighted in orange. To activate the WAN connectivity option of choice, simply click on it. [Figure 2] All configurable settings are kept to the "Settings" page.